Our youngest daughter has been sleeping on a mattress and box spring on the floor, and I'm overdue for making her a "real bed". This was finally finished and delivered in time for her 6th birthday. The bed is in the same plain shaker style as the other furniture I previously made for her room (double dresser, framed mirror, bedside tables, & blanket chest), and even though it's painted and the rest of her furniture is cherry it fits in fairly well. The flat panels, flat drawer fronts, and simple edge treatments echo the other pieces in the room. 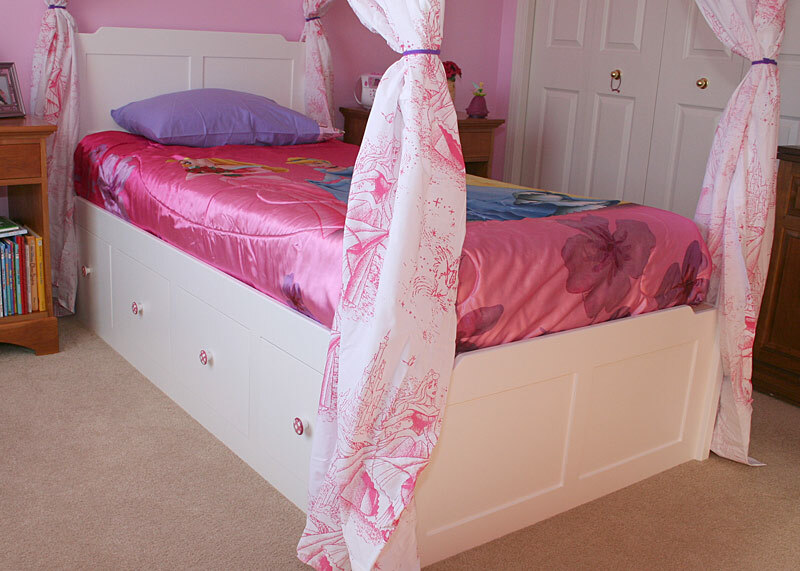 The rest of the furniture in her room is cherry, but she was quite adamant that she wanted a white bed. So that made construction a bit easier since I was able to use a mishmash of leftover wood species - cherry, poplar, and maple. Since they're all closed grain hardwoods they cover equally well and look identical once the paint is applied. We used 2 coats of white Kilz primer and 2 or 3 coats of white latex satin paint. I normally prefer to spray finishes but since this was built in December/January it had to be done in my shop with rollers and brushes. It turned out pretty nicely (thanks to my wife - she is the painter of the house and she did a great job!). I haven't been getting much shop time with our many family and work obligations so I took advantage of 2 weeks off during the Christmas/New Years holidays to get this done quickly. 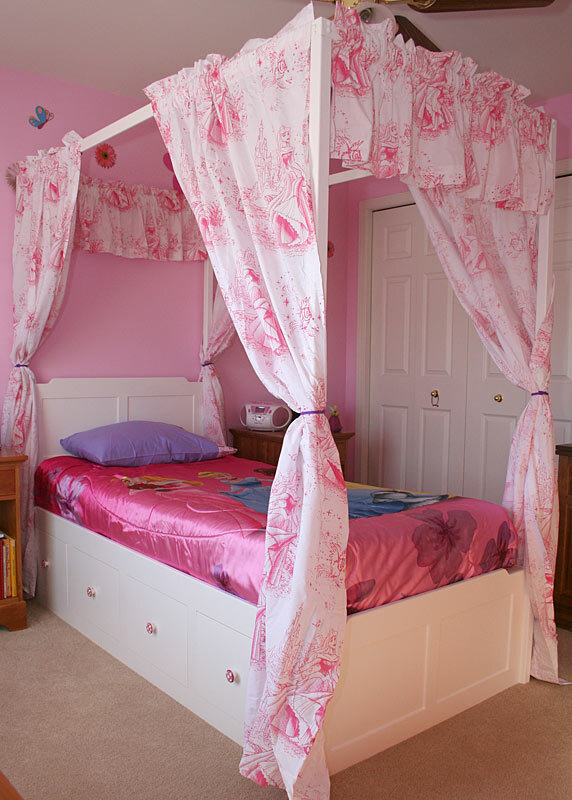 It also helped that the design is very similar to my oldest daughter's bed (she insisted on a canopy bed like her sister's). The primary woods are poplar, cherry, and maple and the secondary wood is soft wormy maple with some pine and plywood for the interior support structure. The drawers were 5/4 stock resawn to 1/2" final thickness and are domino'd at all corners.. 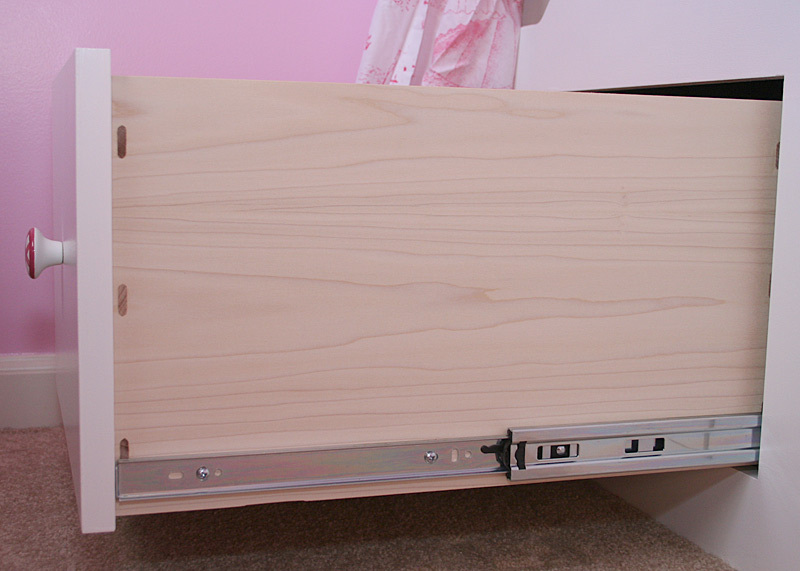 The drawers run on full extension slides, and the drawer pulls match the others in her room. 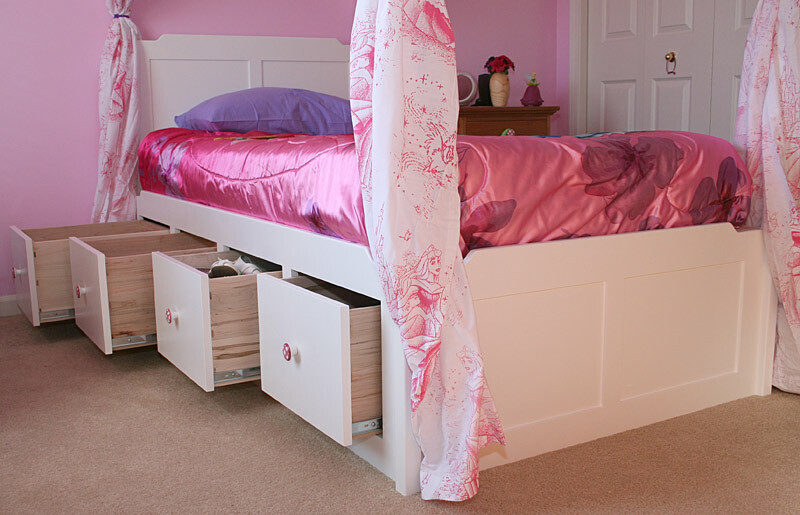 4 big drawers on both sides of the bed give her tons of extra storage space (and young girls can accumulate LOTS of stuff).